This sweet dish is one of the favourite sweet cooked in Jorasanko, where the great poet Rabindranath Thakur resided. This dish was invented by his neice on his 50th birthday. This sweet dish is not found any where in the shops. You have to make it to enjoy it. 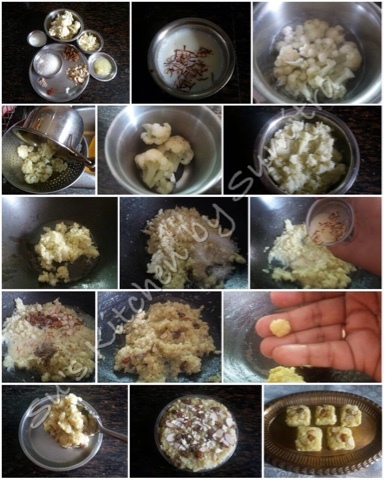 Cauliflower is ground and made in to a barfi. In eairler days it was ground on shilbatta.. but now a days grinders have taken over the kitchen. Soak the saffron in hot milk and keep it aside. Take a pot and boil the cauliflower florets in water till It is cooked. Remove and drain the water out completely. Let it cool. Make a coarse paste of it in a grinder without adding any water to it. The paste should be around a cup. In a wok, heat the ghee. Add the cauliflower paste. Stir it on low heat and stirring it continuously cook it for 5 minutes. Add sugar and 1/2 cup khoya. Keep stirring it till the sugar has dissolve and the khoya has melted. Add the saffron milk, cardomom powder, salt, half of almond chopped and raisins. Stir and cook till the mixture has incorporated well and semi dried up. To check, take a pinch of the mixture and roll it with your fingers, it should form a ball. Grease a plate. Pour the mixture into the plate. Spread it out. It should be 1/2 to 1 inch thick. 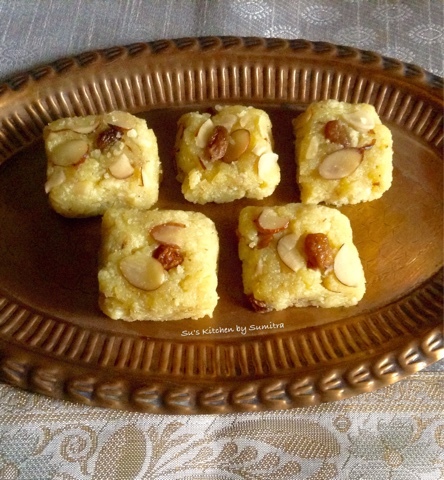 Garnish it with remaining almonds, raisins and a tbsp of khoya. Let it set till it cools completely. Cut it into square pieces and enjoy it.